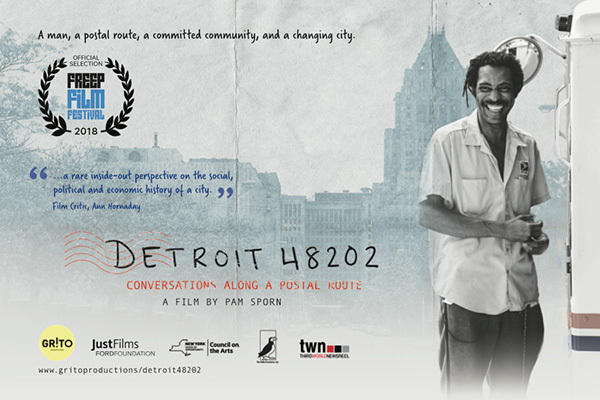 There’s a moment in Pam Sporn’s powerful documentary Detroit 48202: Conversations Along a Postal Route when Julia Putnam, co-founder of Detroit’s The Boggs School, describes an experience that’s as familiar as it is painful for Detroiters born after the ’67 Rebellion. It’s that moment when an elder describes Detroit’s glory days, but in the past tense. A forever past tense. An imaginative documentary premiering in Detroit this weekend looks at the city's decline and revitalization through a veteran mailman's perspective on his New Center rounds. In 2008, We The People of Detroit (WPD) was founded in response to Emergency Management over the city of Detroit and Detroit Public Schools. As a community-based grassroots organization, WPD aims to inform, educate, and empower Detroit residents on imperative issues surrounding civil rights, land, water, education, and the democratic process. DPP works for REAL Community Benefit Agreements, advocates and organizes for truly affordable housing and public transit that responds to the needs of Detroiters. The mission of The Boggs Center is to nurture the transformational leadership capacities of individuals and organizations committed to creating productive, sustainable, ecologically responsible, and just communities. The People’s Water Board advocates for access, protection, and conservation of water. We believe water is a human right and all people should have access to clean and affordable water. DBCFSN works to build self-reliance, food security and justice in Detroit’s Black community by influencing public policy, engaging in urban agriculture, promoting healthy eating, encouraging cooperative buying and directing youth towards careers in food-related fields. The Detroit Historical Society convened diverse groups and communities around the effects of a historic crisis with its Detroit 67: Looking Back to Move Forward project. The Detroit 67: Perspectives exhibition allows visitors to better understand the events of July 1967, what led up to them, where we are today and how to connect to efforts moving Detroit forward. The Wright Museum houses over 35,000 artifacts and archival materials and is home to the Blanche Coggin Underground Railroad Collection, Harriet Tubman Museum Collection, Coleman A. Young Collection and the Sheffield Collection, a repository of documents of the labor movement in Detroit. The mission of the City of Detroit’s Planning and Development Department is to build a city secure in its future, grounded in its roots and hopeful in its present state. The vision that supports this mission is a healthy and beautiful Detroit, built on inclusionary growth, economic opportunity and an atmosphere of trust.